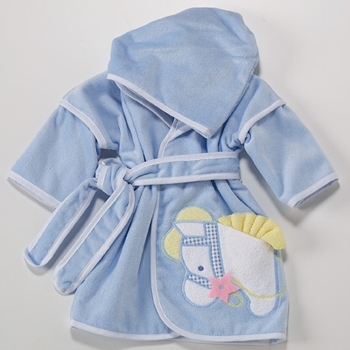 Our pony-themed, hooded bath robe is always a great new baby gift idea. Proudly made in the U.S.A. from 100% domestic cotton fabric. Choose from 3 sizes - 18 months, 3T or Size 6. Optional personalization is available to make will make for an even more special gift! ProsBeautiful design and personalized. Recipient was thrilled.